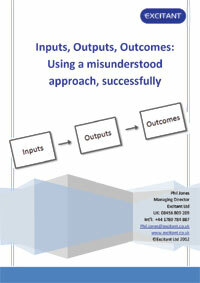 The Input-Output-Outcome model, sometimes called The Outcome model, is used extensively in the UK public sector. Given this wide use, you would think the outcome model would help front line organisations explain their services. It does not. To receive the outcome model paper, complete the form at the bottom of the page. This paper explains why the outcome model fails and how you can make it work far better. This applies in the UK public sector and other sectors, such as regulated utilities (OFWAT and OFGEN) that use this model. The paper also explains how you can change how you use the model, so it can be a much more effective model of change for you, your organisations and the people you serve. Why does the outcome model fail? Our findings are that the UK public sector provides almost no guidance on the richness behind the input, output, outcome, model and how the model can really be used and exploited. Worse still many examples mislead the user. As a result, anyone trying to develop Inputs, outputs and outcomes can quickly get in a muddle. The problems really start when trying to link these three components together: simply saying, outputs lead to outcomes, does not provide any method to model what can be a complex situation. You need to explain what causes change to happen. If your model does not describe change clearly, how can an external auditor judge a service, or programme? What lies behind the model to make it work? 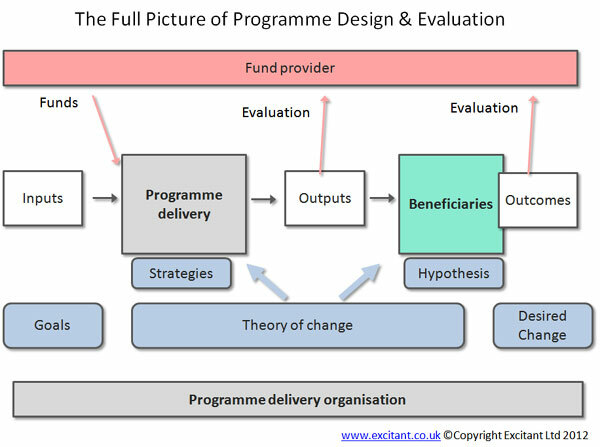 This paper explains the origins of this approach, called “The Logic Model” that is used for the evaluation of programmes in a social change context. Knowing this will help you define and explain the logic of your model of social change. In doing so we provide a set of simple improvements that will enhance your input-output-outcome model. Take care though. The origins of this model lie in external evaluation. What an external body needs to assess the impact of a programme is quite different from what you need to manage that same programme. What is needed is an approach that will also help the designers and managers of a programme by providing feedback and learning on what works. The paper also explains where this fits in and how to achieve this. It would be sensible to integrate external evaluation with the management processes the organisation uses. It makes it easier to explain to funders what they are doing, why and what works. Again we explain how this can happen. Deeply hidden at the heart of this model is a ‘Theory of Change’. Your ‘Theory of change’ should explain how you will change the outcomes of the people you serve. To get to this model you have to step well beyond the simplistic view of input-output-outcome model. You have to explain your strategies that will bring about your change. Do this and the tools change to useful tools of outcome design and management. The diagram below will give you an an insight into the richness of this deeper, fuller (and far more useful) model. Finally, the paper suggests that a significant problem with public sector change is not in the quality of thinking about change. The problem is in the way that thinking gets translated into action (and poor explanations of models actually undermine effective change). This paper cuts through this poor example to help you translate your strategy into effective organisational or social change.